A checklist was published of land snails from the Sierra Bibijagua on the Isla de la Juventud, south of Cuba by Herrera-Uria (2016). The abstract reads “Sierra Bibijagua are marmoreal elevations located on northern Isla de la Juventud (Island of Youth), southwestern Cuba. Isla de la Juventud is the largest island (2,200 km2) of the Canarreos Archipelago, Greater Antilles. 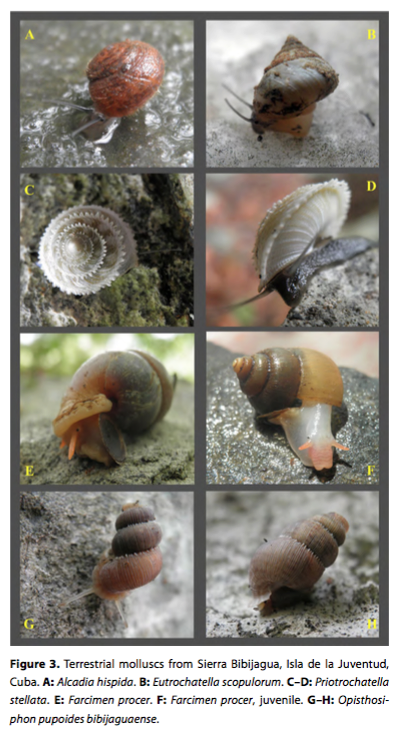 A checklist of terrestrial molluscs re- corded from Sierra Bibijagua is presented, including the following information: synonymy, type locality, updat- ed distribution, endemism, and photographs of shells and living individuals whenever possible. e checklist comprises 12 families and 16 genera currently known from the area, including six new records: Farcimen pro- cer, Leidyula oridana, Liguus fasciatus, Subulina octona, Glandinella poeyana, and Bradybaena similaris”. This entry was posted in Uncategorized and tagged cuba, literature on February 7, 2017 by bramb.